You can get as poetic about the moon as you want  and everyone from lovers to lyricists to astronauts has had a go at it. But the fact is, the thing's a lump  beautiful, to be sure, but a lump all the same, created more than 4 billion years ago when a Mars-size planetesimal whizzed by, collided with Earth and blasted out a mass of molten debris that eventually cooled into the moon. In fact, the moon is a series of lumps within lumps. Even as it was congealing, it did so unevenly, with scattered areas of high density that senologists labeled mascons  for mass concentrations. The highlands and plains are made of differing materials too. Higher local density means stronger local gravity, which can not only wreak havoc on precisely calibrated spacecraft orbits but can also reveal a lot about the innards and the history of the moon itself  provided you know how to read those gravitational flutters. NASA is preparing to do just that, launching the GRAIL mission (Gravity Recovery and Interior Laboratory) on a nine-month journey to deepen our understanding of Earth's closest neighbor. The GRAIL spacecraft, which launched on Sept. 10, is actually two spacecraft, each about the size of a washing machine. Named, prosaically enough, GRAIL-A and GRAIL-B, they were lofted aboard the same booster and then released in space for separate but closely coordinated flights to the moon. A translunar journey typically takes less than three days, but the GRAIL ships will exceed that by just a bit  not arriving until New Year's Eve in the case of GRAIL-A and New Year's Day in the case of GRAIL-B. Rather than covering the 239,000-mi. (385,000 km) distance from the Earth to the moon in a straight, as-the-crow-flies shot, the ships will follow a looping, 2.5-million-mi. (4 million km) trajectory. The longer route and slower speed allow the spacecraft to carry less fuel and ensure that when they do arrive at the moon they can be inserted into orbit more precisely  and precision is everything when it comes to the GRAILs. During the three months the ships will spend actively studying the moon  from early March to late May  they will maintain a distance of 100 to 225 km (62 to 140 mi. ), depending on what part of the lunar anatomy they're surveying. A tracking system aboard the ships will measure any change in range between the two within a difference of a few microns  or about the size of a red blood cell. And that shifting distance is exactly what the scientists will be looking for. Flying over a mascon will be like driving over a speed bump, jolting the two ships and causing them to shake a bit relative to each other. The denser the mass concentration  and the bigger the gravity jolt  the greater the degree of disruption will be. "We'll use the moon's gravity to tell us what's inside the moon, all the way down to the core," says principal investigator Maria Zuber of MIT. NASA is prepared for glitches and false positives in the data. No unmanned spacecraft have ever flown in such balletic tandem around another world, and flight planners will thus be refining their navigational skills in real time. Even the solar wind  the stream of charged particles that flow outward from the sun  could disrupt the readings. Indeed, one more reason for the roundabout translunar route was so that scientists could measure the wind precisely and correct for it as the data is analyzed. Assuming the mission achieves what it's designed to achieve, the GRAILs will do more than reveal new insights about the innards of the moon and the origins of the solar system. 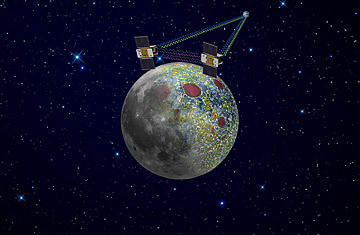 They will also help NASA select promising sites for future lunar landings. Such ambitious future missions, of course, require both funding and programmatic clarity that are nowhere in evidence at the moment. But in the event policymakers ever do set their sights moonward again, GRAIL will help tell them precisely where to aim. See pictures of Apollo 8's historic flight. See the top 10 sun myths.